A scale is a list of all the notes in a key. Major scales all follow the same interval pattern. The simple, sing-along, nursery rhymes and folk songs we learn as children, the cheerful, toe-tapping pop and rock we dance to, the uplifting sounds of a symphony: most music in a major key has a bright sound that people often describe as cheerful, inspiring, exciting, or just plain fun. 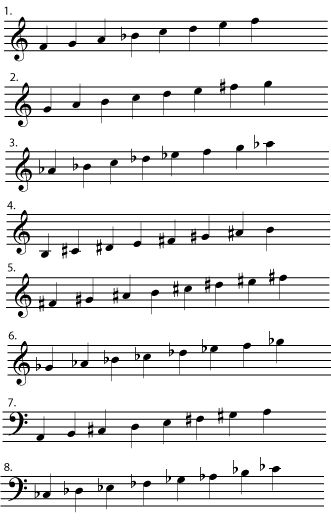 Music in a particular key tends to use only some of the many possible notes available; these notes are listed in the scale associated with that key. 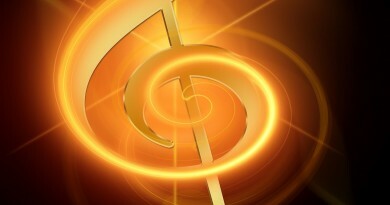 The notes that a major key uses tend to build “bright”-sounding major chords. They also give a strong feeling of having a tonal center, a note or chord that feels like “home” in that key. The “bright”-sounding major chords and the strong feeling of tonality are what give major keys their pleasant moods. major almost always ends on an A major chord, the chord built on the note A. It often also begins on that chord, returns to that chord often, and features a melody and a bass line that also return to the note A often enough that listeners will know where the tonal center of the music is, even if they don’t realize that they know it. To find the rest of the notes in a major key, start at the tonic and go up following this pattern: whole step, whole step, half step, whole step, whole step, whole step, half step. This will take you to the tonic one octave higher than where you began, and includes all the notes in the key in that octave. 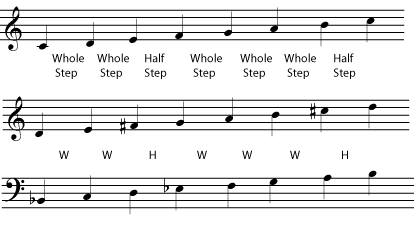 These major scales all follow the same pattern of whole steps and half steps. They have different sets of notes because the pattern starts on different notes. 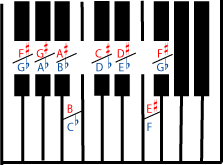 Notice that although they look completely different, the scales of F sharp major and G flat major (numbers 5 and 6) sound exactly the same when played, on a piano as shown here, or on any other instrument using equal temperament tuning. If this surprises you, please read more about enharmonic scales. In the examples above, the sharps and flats are written next to the notes. In common notation, the sharps and flats that belong in the key will be written at the beginning of each staff, in the key signature. What difference does key make? Since the major scales all follow the same pattern, they all sound very much alike. Here is a folk tune (“The Saucy Sailor”) written in D major and in F flat major. The same tune looks very different written in two different major keys. Listen to this tune in D major and in F major. The music may look quite different, but the only difference when you listen is that one sounds higher than the other. So why bother with different keys at all? Before equal temperament became the standard tuning system, major keys sounded more different from each other than they do now. 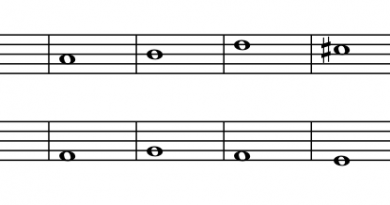 Even now, there are subtle differences between the sound of a piece in one key or another, mostly because of differences in the timbre of various notes on the instruments or voices involved. But today the most common reason to choose a particular key is simply that the music is easiest to sing or play in that key.